"The War" (German: "Der Krieg"), sometimes known as the Dresden War Triptych, is a large oil painting by Otto Dix on four wooden panels, a triptych with predella. The format of the work and its composition are based on religious triptychs of the Renaissance. It was begun in 1929 and completed in 1932, and has been held by the Galerie Neue Meister in Dresden since 1968. 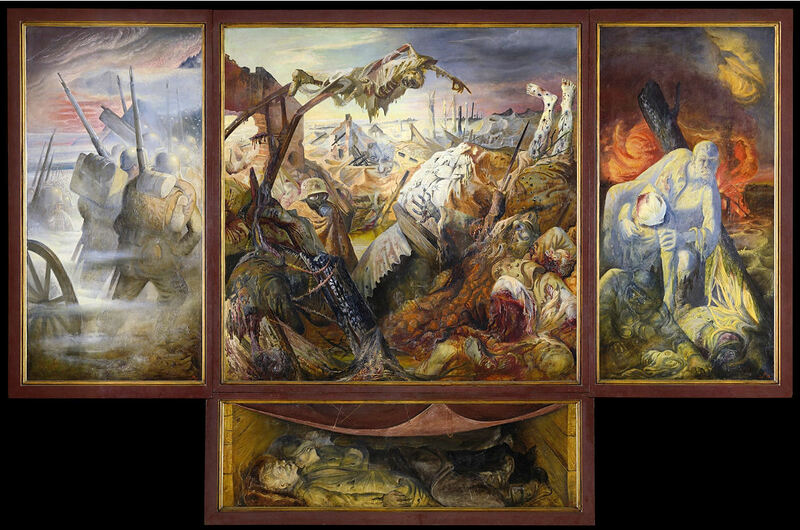 It is one of several antiwar works by Dix in the 1920s, inspired by his experience of trench warfare in the First World War. The triptych has three main panels, with a fourth as a supporting panel or predella below the main central panel. The large central panel is a 204 cm (80 in) square; the flanking panels to either side the same height but half the width, 102 cm (40 in) each; and the predella below the central panel has the same width but is only 60 cm (24 in) high. From left to right, the left wing depicts a column of German soldiers marching away from the viewer through the fog of war towards the battle in the central scene. The central panel shows a devastated urban landscape scattered with war paraphernalia and body parts, reworking the themes in his 1923 work "The Trench," and divided like the 16th century Isenheim Altarpiece of Mathias Grünewald with a living side to the lower left and a dead side to the upper right. A skeletal figure floats above the scene, pointing to the right, with a solder in gas mask below, and scabrous legs upended to the right, recalling the legs of Christ in Grünewald's crucifixion scene. The right wing shows several figures withdrawing from the fight. A dominant greyish figure, helping a wounded comrade, is a self-portrait of Dix himself, in a composition similar to a descent from the cross or a pietà. In the predella, several soldiers are lying next to each other, possibly sleeping under an awning, or perhaps the dead in a tomb. This fourth panel is based on "The Body of the Dead Christ in the Tomb" by Hans Holbein the Younger. It's a shattering, horrifying, powerful work.